User profile disks (UPD) store user and application data on a single virtual disk that is dedicated to one user’s profile. Virtual disks are reattached at logon and are completely transparent to the user, so the user can save their data or change and save their app settings on what appears to be a local disk. All personal data and settings persist when connecting to different computers in a virtual desktop collection or session collection. In the RAS Console, navigate to Farm / Site / Terminal Servers. Right-click a server and click Properties in the context menu (this will open server properties). Clear the Inherit default settings option. Select the Enable user profile disks option. Specify a network location where the disks should be created using the Microsoft Windows UNC format (e.g. \RAS\users\disks). Specify the maximum allowed disk size (in gigabytes) in the Maximum size field. 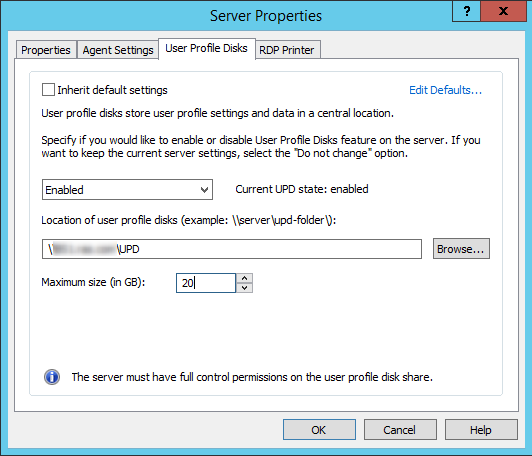 Please note that the server must have full control permissions on the user profile disk share.